We now service pick up trucks and SUV's. For over 30 years, we have been servicing just about every type of trailer, container, cube van, box truck – you name it – in the Chicago area. When your trailer breaks down, you don’t want to “bring it in” because sometimes you can't! And you don’t want to wait 6 hours only to hear “I can't fix that" or "That's the first time I’ve ever seen THAT!”. We’ve serviced everything from small utility trailers up to semi-trailers; and everything in between. 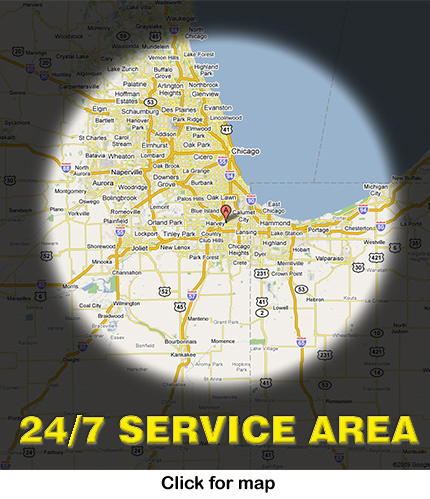 We do it at YOUR convenience, not ours, wherever it is in the Chicago area. We'll get there in a reasonable amount of time - typically less than 2 hours. Road Service - Brakes - Hydraulic, Electric, Air - And FROZEN!